Whether your nonprofit operates on a calendar year or fiscal year, what happens in December is critically important to your annual fundraising success. Did you know that giving spikes at the end of the year, every year? 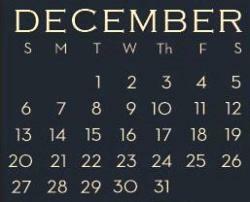 Fully one-third of December's gifts occur on December 31. So, how can you raise more money in the last four weeks of the year? What's a LYBUNT? In fundraising terms, it's someone who gave Last Year But Unfortunately Not This. Donor retention is critically important, yet it's easy to overlook in the quest for new donors. So, who are your LYBUNTs and what do you need to do to get them give? Run a report to identify who gave last year and who hasn't made a gift yet this year. Consider the names on your list. Can you reach them all, or do you need to prioritize? Ask them to renew their gift. Need more help? Gail Perry offers 5 tips that will help you renew these donors and bring in more gifts before the end of the year. Did you know? According to the 2014 M+R Benchmark Study, the average nonprofit sends 7 fundraising emails in December. Yes, I know, that's a lot. And there's no denying that email appeals have become an important part of many nonprofits' online fundraising strategy. However, instead of sending so many emails, think about sending a short series, right at the end of the year. On December 28, send a short email with a single call to action (Give! ), and remind people they only have a few days left to do so this year. Include instructions on how to give, including a link to your online donation page. On December 30, send another (shorter) email with the same message. On December 31, send a final (even shorter) email that is focused on the deadline. This time of year, most people go to your site to give. They don't go to learn about your programs or meet your staff and board or read your mission statement. In your emails and digital communications, when "Give Now" is the call to action, don't send donors to your home page. You will improve your conversion rate and increase donations when you send donors directly to the online giving page. Ideally, you want a single-page donation form with as few required fields as possible. When you have too many fields or too many pages, you will lose between 50-70% of potential online donors. Don't forget mobile! Mobile giving is on the rise, and your online giving form needs to be optimized for smart phones and tablets. If you're sending an email appeal, you need the recipient to open it (then read it, then click-through) before they'll give. Let's focus on getting it opened. What can you do to stand out in the inbox? SENDER: This should be a real person with a real name. Don't send email from the organization as an entity. Ideally, the sender should be someone the reader knows (or at least recognizes), likes and trusts. SUBJECT: Pay attention to your subject line. 80% of people will read the subject line and 69% of people decide to open an email based on the subject line alone. Using the recipient's name in the subject line can improve open rates. TIMING: Consider this. Fewer emails are sent at night and on weekends. Yet we're a highly connected society, often checking email  yep, you guessed it  at night and on weekends. If you send your email when there's less activity in your donor's inbox, you just might get their attention. The last few weeks of the year will fly by, so consider which of these tips are the most doable this year. Make a list and check it twice. Then you'll have your year-end fundraising in the bag. Need help? Send me a message and let's talk about how Third Sector Consulting can help you raise more money. Did you know that some words (like "Helping," "Fundraising," and "Donate") actually hurt your email open rate? Others (like "Important" and "Urgent") can actually improve it. Check out these tips for writing winning email appeals and, of course, getting them opened.